Campbell BIOLOGY is the unsurpassed leader in introductory biology. 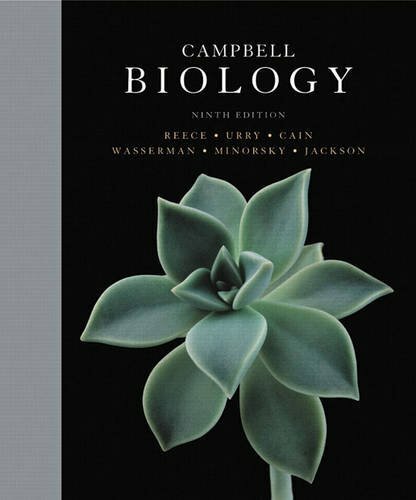 The text’s hallmark values―accuracy, currency, and passion for teaching and learning―have made it the most successful college introductory biology book for eight consecutive editions. As Neil Campbell’s longtime collaborator, Jane Reece has participated in every edition of BIOLOGY. Earlier, Jane taught biology at Middlesex County College and Queensborough Community College. Her research as a doctoral student and postdoc focused on genetic recombination in bacteria. Besides her work on BIOLOGY, she has been a coauthor on Biology: Concepts & Connections, Essential Biology, and The World of the Cell. Lisa Urry (Units 1-3) is a professor and developmental biologist, and recent Chair of the Biology Department, at Mills College. After graduating from Tufts University with a double major in Biology and French, Lisa completed her Ph.D. in molecular and developmental biology at MIT. She has published a number of research papers, most of them focused on gene expression during embryonic and larval development in sea urchins. Lisa is also deeply committed to promoting opportunities for women in science education and research. Michael Cain (Units 4 and 5) is an ecologist and evolutionary biologist who is now writing full time. Michael earned a joint degree in Biology and Math at Bowdoin College, an M.Sc. from Brown University, and a Ph.D. in Ecology and Evolutionary Biology from Cornell University. As a faculty member at New Mexico State University and Rose-Hulman Institute of Technology, he taught a wide range of courses including introductory biology, ecology, evolution, botany, and conservation biology. . Michael is the author of dozens of scientific papers on topics that include foraging behavior in insects and plants, long-distance seed dispersal, and speciation in crickets. In addition to his work on Campbell BIOLOGY, Michael is also the lead author of an ecology textbook. Steve Wasserman (Unit 7) is a professor at the University of California, San Diego (UCSD). He earned his A.B. in Biology from Harvard University and his Ph.D. in Biological Sciences from MIT. Through his research on regulatory pathway mechanisms in the fruit fly Drosophila, Steve has contributed to the fields of developmental biology, reproduction, and immunity. As a faculty member at the University of Texas Southwestern Medical Center and UCSD, he has taught genetics, development, and physiology to undergraduate, graduate, and medical students. He has also served as the research mentor for more than a dozen doctoral students and more than 50 aspiring scientists at the undergraduate and high school levels. Steve has been the recipient of distinguished scholar awards from both the Markey Charitable Trust and the David and Lucille Packard Foundation. In 2007, he received UCSD’s Distinguished Teaching Award for undergraduate teaching. Peter Minorsky (Unit 6) is a professor at Mercy College in New York, where he teaches evolution, ecology, botany, and introductory biology. He received his B.A. in Biology from Vassar College and his Ph.D. in Plant Physiology from Cornell University. He is also the science writer for the journal Plant Physiology. After a postdoctoral fellowship at the University of Wisconsin at Madison, Peter taught at Kenyon College, Union College, Western Connecticut State University, and Vassar College. He is an electrophysiologist who studies plant responses to stress. Peter received the 2008 Award for Teaching Excellence at Mercy College. Rob Jackson (Unit 8) is a professor of biology and Nicholas Chair of Environmental Sciences at Duke University. Rob holds a B.S. in Chemical Engineering from Rice University, as well as M.S. degrees in Ecology and Statistics and a Ph.D. in Ecology from Utah State University. Rob directed Duke’s Program in Ecology for many years and just finished a term as the Vice President of Science for the Ecological Society of America. Rob has received numerous awards, including a Presidential Early Career Award in Science and Engineering from the National Science Foundation. He also enjoys popular writing, having published a trade book about the environment, The Earth Remains Forever, and two books of poetry for children, Animal Mischief and Weekend Mischief. Neil Campbell combined the investigative nature of a research scientist with the soul of an experienced and caring teacher. He earned his M.A. in Zoology from UCLA and his Ph.D. in Plant Biology from the University of California, Riverside, where he received the Distinguished Alumnus Award in 2001. Neil published numerous research articles on desert and coastal plants and how the sensitive plant (Mimosa) and other legumes move their leaves. His 30 years of teaching in diverse environments included general biology courses at Cornell University, Pomona College, and San Bernardino Valley College, where he received the college’s first Outstanding Professor Award in 1986. Neil was a visiting scholar in the Department of Botany and Plant Sciences at the University of California, Riverside. In addition to his authorship of this book, he coauthored Biology: Concepts & Connections and Essential Biology with Jane Reece. For the Ninth Edition of this book, we honor Neil’s contributions to biology education by adopting the title Campbell BIOLOGY. Reece, Jane B.; Urry, Lisa A.; Cain, Michael L.; Wasserman, Steven A.; Jackson, Robert B.; Minorsky, Peter V.
Reece, Jane B.; Urry, Lisa A.; Cain, Michael L.; Wasserman, Steven A.; Minorsky, Peter V.; Jackson, Robert B.